It is a great pleasure to be in Morocco to launch the third MENA-OECD Business Forum and Women Business Leaders Summit, in the presence of such an impressive audience. I would like to thank, the Government of Morocco, the Confederation of Moroccan Enterprises, l'Association des femmes chefs d'entreprises du Maroc, BIAC, and our other partners for their enthusiastic and efficient contribution to the organisation of this important event. Many things have changed since our last MENA Business Forum in Cairo. During the past year, we have gone through the gravest financial and economic crisis of our lives. The global reach and the social impact have been unprecedented. But the collective response of governments stood up to the test, with the implementation of decisive macroeconomic measures and the largest global fiscal stimulus ever. After two years of bad news, the global economic scenario is now improving. However, most of our structural challenges are still there. It is time to look “beyond the crisis”, as the title of this event so prudently suggests. It is time to draw together the route map towards a self sustained recovery based on stronger, cleaner and fairer economic growth. In the midst of this transformation, how do we see the impact of this crisis and the economic outlook in the MENA countries? What is the new role for business? And how can the participation of women help these countries produce a stronger recovery? Let me share with you some reflections on these very important questions. The global financial and economic crisis has impacted the MENA region. The “triple shock” of a financial crisis coming on the heels of a fuel and food crisis has had an important effect, but compared to other parts of the world, the region is faring quite well. Growth may reach a respectable 2.2% this year. This is encouraging in a difficult global context, but it is nonetheless a significant fall when compared to the buoyant period between 2000 and 2008, when the MENA GDP grew by an annual average of more than 5%. The crisis has also had an impact on external accounts. In 2009, the current account surplus should halve to around 7 percent of GDP, remittances are projected to fall by 6% and global FDI inflows to the region are projected to contract by a third. The human and social impact of a crisis is always the most tragic part of the story. According to the International Labour Organisation (ILO), the number of unemployed may increase by around 25% in the Middle East and approximately 13% in North Africa in 2009 compared to 2008. This is alarming. The policy mix to address these challenges is necessarily a function of the particular situation of each country. However, all countries have to confront a common fundamental question: What can we learn from this crisis in order to change and build stronger, cleaner and fairer economies? The current financial, economic and social crisis has exposed the importance of governance, of having the right regulatory framework and of enforcing it properly. These are necessary conditions for markets to function properly. In the coming years, the MENA countries will have the opportunity to reassess and rebuild their governance frameworks. They should use this opportunity to build a new balance between markets and regulations. We need to remove the bottlenecks to growth. We also need to ensure that this growth is sustainable, based on cleaner energy, and that it is a vehicle to reduce socio-economic disparities. Governments and private business should work together to achieve these goals. Governments are responsible for the regulations, the institutions, the lean public administration and the transparency that support the investment climate. Governments must find the right balance between an effective regulatory and institutional framework and minimising unnecessary red tape. In the post crisis era, governments will need to address the structural challenges of their economies with far reaching and deep reforms. They have a historical window for change. Reforms can become an effective vehicle for sustained recovery. And when I say sustained, I am talking about two types of sustainability: fiscal and environmental sustainability. These are two strategic objectives that our recovery strategies have to pursue. But governments cannot reset the economy on their own. This is not a solo challenge. The contribution of our private sectors will be central. Businesses may not have total control over their operating environment, but they can definitely implement internal changes to become more competitive, to better adapt to a changed global economy and to be drivers of change, instead of mere spectators. Strong corporate governance is an important prerequisite for attracting long-term capital. This is one of the main fields of MENA-OECD collaboration, through the Investment Programme. In the midst of a major confidence crisis, business conduct has also become strategic. 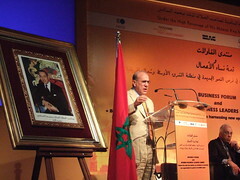 The MENA Forum on Responsible Business Conduct brings together business, government and civil society. I expect the panel on this subject that will meet later today, to bring concrete proposals to Ministers tomorrow. Another crucial condition to expand business opportunities and to increase the resilience of national economies is the willingness to embrace innovation. Innovative firms anticipate change; they drive it. The current crisis will bring many changes and opportunities. Think, for example, of the possibilities that the fight against climate change is opening to all kinds of green business. Let me conclude by highlighting another crucial way in which business can contribute to harness economic growth in the MENA countries: they can encourage the participation of women in business activities. Women can be fundamental agents of economic growth and development. In several OECD countries, small and medium enterprises owned by women are growing at a faster pace than the economy as a whole. In the United States, Ireland and Spain, for example, women are launching new businesses at a faster rate than men and are expanding their share of business ownership. This is helping create jobs and is supporting growth at a crucial moment. The MENA countries are making progress in this area, but they are still facing important challenges. The rate of participation of women in the labour force remains as low as 11 per cent in West Bank Gaza and 15 per cent in Saudi Arabia. This is a missed opportunity for growth: a recent study shows that if women’s participation in the MENA labour force had increased at the same rate as their levels of education since the 80s, the average household income today would be 25% higher. This speaks of missed opportunities, of wasted talent, of frustrated expectations. The crisis should lead us to rethink. The financial, economic and social crisis is the product of a series of massive failures in financial regulation, supervision, corporate governance, risk management, debt rating, incentives orientation, business ethics, economic forecasting, global governance and communication. The cost of these failures is turning out to be massive: more than 50 million new unemployed, trillions of dollars in equity, homes and pensions losses; unprecedented public deficits that will weaken governments for years and an extra 90 million people living in poverty. We must learn from these failures. Governments must question the way they manage their economic and financial systems, the long-term effects of their policies, the social and environmental dimensions of reforms or the effects of taking no action. At the same time, business must foster a new entrepreneurship culture based on a new sense of global responsibility; aware of the ultimate consequences of alternative strategies; beneficial to the environment, socially inclusive and with an increasingly relevant role for women. Addressing those challenges will demand unprecedented communication, cooperation, leadership and political will. That’s why we are here today to make sure that we can deliver. You can count on the OECD to travel the journey together with you. I wish you an interesting and productive forum.